Gear Up For May Events At Skate World! May is jam-packed with super-cool fun things to do with us at Skate World Center. Take a look at just a few of the events we have planned for May, then mark your calendars! 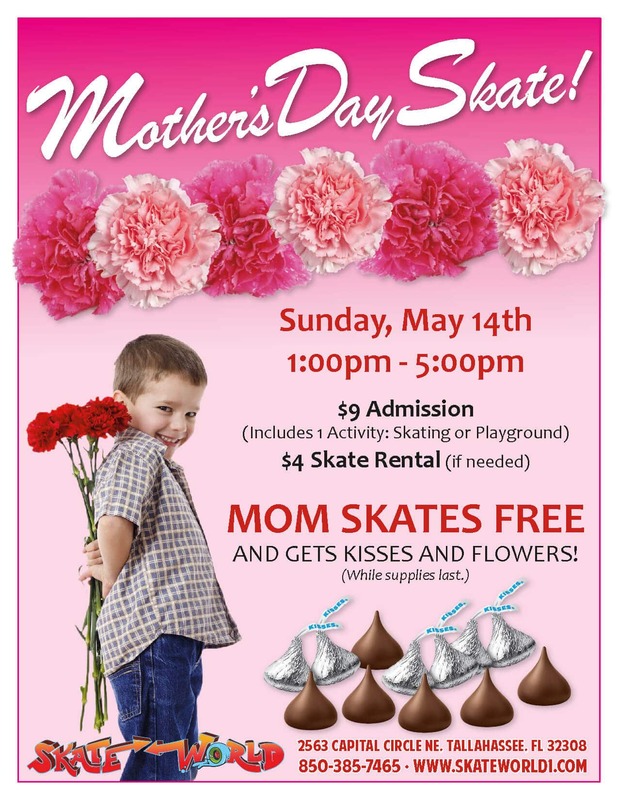 Mother’s day Skate – May 14, 2017, from 1 to 5 p.m. $9 Admission includes 1 attraction of roller skating or the playground. $4 Skate rental. 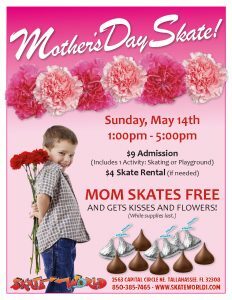 Moms skate free and will get Hersey kisses and flowers from the Skate World Center team! Early Release Skate – May 25, 26 and 30, 2017, from 1 to 4 p.m. Admission is $9 and skate rental is $4. Admission includes 1 attraction of roller skating or the playground for children ages 10 and under. Memorial Day Family Sk8 Mania – From 11 a.m. to 8:30 p.m. $2 skate admission and $2 skate rental. These are just a few of the awesome events we have planned at our facility for May, but be sure to check our Facebook page frequently to stay up-to-date with what’s going on at Skate World Center. Be the first to know about special events and receive special discounts or promotions!